Before you begin learning how drawing clothes on a person, you need to understand the structure of your subject. Whether you intend to draw tight or loose clothing on a person, their pose will affect how the clothing rests on their figure. Once again, surface direction will be key in accurately drawing clothing on a person. 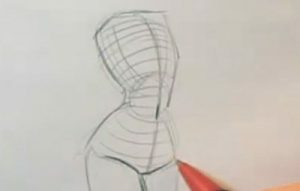 When learning how to draw clothes on a person, adding in these lines to show surface direction will help you understand the contours of a person’s body and how the clothing will rest on them. In this example we can see from the lines that the back is slightly arched while our subject is pushing out her rear end a little bit. It is important to note that surface direction will change based on our perspective. This example perfectly demonstrates this principle as the lines on our subject’s leg change as they go further down her leg. This is due to the fact that the lower part of her leg is further away from us than the upper part. Once you have drawn your figure and you understand the different bits of surface direction, you’re ready to start learning how to draw clothes on a person. In this example we are adding a bikini, very form fitting and responsive to the subject’s body. Notice the straps going around the back and how they follow directly along the lines of the surface direction. Depending on what bottoms you want to add to this woman, you may have to alter some of the details in the drawing. 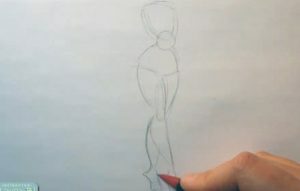 If you are going for a fuller bottom (“boy cut”) then the bottoms will closely follow the lines that define where the leg meets the groin/torso. However, if you switch to bikini bottoms, then these details will become more subtle, perhaps showing just a hint of her groin line. We hope you enjoyed this article on how to draw clothes on a person. Why not pop some feedback in the box below?